One of the biggest sins a Fringe show can commit is to be overlong - the temporary seating just isn't up to it and if you start to lose the audience's attention they quickly become unsettled and start to fidget. With a runtime of just 40 minutes "Mehndi Night" is a blessing for the Fringe-goer and there's no padding here - every line is carefully crafted and made to count. This production by Mulberry School for Girls, written by professional playwright Fin Kennedy is set around a traditional Bengali pre-wedding event where the female family members are gathered - similar to a hen night without the excesses. The cast come on stage out of character and explain in rhyme/song that they are presenting the play about their families, their traditions and we are cleverly introduced to each character as the performer 'steps' into their role. The performances are all of a high standard with Rubina Begum as Ripa delivering a brilliantly confident performance in a role that holds the show together, acting as the narrator and delivering her lines in rap/rhyme. I really can't single out others as they were all excellent, delivering complex sequences of intertwined lines with perfect timing. I'll not go into the plot in detail as the way it is gradually revealed is part of the show, but it addresses a number of the issues facing young women of Bengali origins, and equally relevant to many others. Arranged marriages, family jealousies, religion, dress, music, family history, it's all covered here and not just glossed over. All sides of the debates are given voices, and all sound authentic and genuinely held opinions. My only quibble with the piece is what I felt to be a disheartening ending with the main character still being forced to make a choice between following her dreams and her family. I'm saddened that they didn't believe there to be a middle ground and I'd have hoped that even the act of bringing such a show to Edinburgh would highlight the importance of holding on to your dreams and ambitions. "Mehndi Night" is a truly delightful piece and Kennedy has done a wonderful job in his stated aim of giving these young adults a voice, and achieved it in an entertaining, amusing and challenging manner. As well as an insight into the Bengali culture the show has also had a major impact on my thoughts on identity - I had never before considered just how strong the 'London' aspect of identity is, but it's clearly a major part of how many people would describe themselves - an interesting element when so often such debates are focused on Englishness/Britishness. And if you make it along, make sure you pick up a programme - for £1.50 it includes a full script and is well worth having. 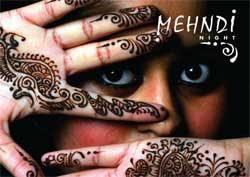 Mehndi Night runs at Venue 45 until 11th August at 12:10. I wasn't at this, however Statler brought back the programme for me to read. It was nice that the entire script was included within it. For those that go it's well worth having a read through the script afterwards. Thanks Statler! So glad you liked it. Just in case anyone's not familiar with Fin's blog it's located at http://finkennedy.blogspot.com/.